Today in 1950, the invention of the phototransistor was announced by Bell Telephone Laboratories. 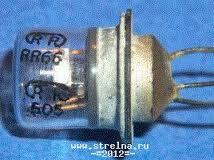 This was a transistor operated by light rather than electric current, invented by Dr. John Northrup Shive. A few weeks ago, Bob Metcalfe reviewed a new history of Bell Labs, The Idea Factory, by Jon Gertner, taking issue with Gertner’s romanticized “view of the place,” and arguing that “trusting research to corporate monopolies is problematic in two ways. First, their money comes from overcharging customers by using monopoly power…. Second, a corporate monopoly has little motivation to disrupt a market that it already dominates. This entry was posted in Bell Labs, Innovation, Transistor. Bookmark the permalink.